Jaguar sports car line, in abeyance since 1939, was dramatically revived in 1948 with the sensational arrival of the XK120. One of the worlds most outstanding sports cars it found particular favour in America where, with the MG, it spearheaded a sports car revival. Demand for the car caught William Lyons by surprise, he had envisaged at most a single years manufacturing life, so the aluminium body was coach built in the traditional manner. Such was the demand that in 1950 a switch was made to a quantity production pressed steel shell, although they retained the aluminium doors, bonnet, and boot lid. The 3.4Ltr XK straight-6 engine was quite advanced for the time and remained the basis of Jaguar engines until the late 1980s. It had dual overhead-cams, twin side draft SU carburetors and an alloy head. The cars also had removable windscreen so aero-screens could be used if preferred. The removable rear wheel spats, which gave a more streamlined look, had to be omitted from cars running center-lock wire wheels as there wasn’t enough clearance for the knock offs. Unfortunately the brakes, being drums all round, did have a tendency to fade with heavy use. The 7.5 mile Dundrodd circuit, near Belfast, based on public roads, was used for the RAC Tourist Trophy for sports cars between 1950 and 1955. It proved to be a severe test of men and machine and attracted the greatest drivers of the day. The 1950 race was held in heavy rain and XK120s achieved a 1-2-3 victory in the TT. On the eve of his 21st birthday Stirling Moss drove Tom Wisdom's car to a brilliant win leading Whitehead and Johnson across the line, and Jaguar took the team prize. Moss’ winning average speed was 75.15 mph and he set a lap record of 77.16 mph. This race was the real catalyst to Moss’ career. Grand prix beckoned and Stirling Moss remains the world's best all round racing driver with a starts to wins ratio, across all forms of motor racing, that remains unbeaten to this day. Several XK120s used the steeply banked oval at the Montlhéry to set world distance/speed records. 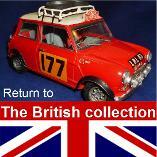 This model is the subject of a restoration article in our projects and articles pages. There you can find more information on the process, re-painting and scratch building that was involved. The tonneau cover is made from tissue paper! Halfords car paints have been used for much of the painting with Citadel acrylic paints for the details.